Lead is allowed to be intentionally added to brass and bronze provided the level of lead complies with the 0.25% limits of federal law and passes the NSF/ANSI 61 lead leaching protocol. Lead is added to brass or bronze to enable surfaces to be machined more easily. A faucet can pass the standard’s lead leaching protocol while still contributing more than 20 ppb in a 250 mL sample even after the installed faucet is cleaned and repeatedly flushed with water. 20 ppb was the action level for schools and child care facilities in an older version of EPA’s 3Ts guidance. In October 2018, EPA eliminated the action level in its updated 3Ts guidance. NSF’s lead leaching protocol for fixtures like faucets involves a 3-week evaluation using water that is more corrosive than the average drinking water but less corrosive than water from some parts of the country. The more corrosive the water, the more lead will leach from the faucet. Mounts three or more faucets from a single model provided by the manufacturer in a rack that allows only the water that is in contact with the wetted-side of the faucet to be sampled. Measures the amount of water within the cold-side of the faucet. For most faucets, this is less than 250 mL but can be much more for fixtures like drinking water fountains. Rinses the faucet with cold water to remove extraneous debris and contamination on a Friday. Adding cold water on Friday evening and letting it set inside the faucet over the weekend. Adding water and letting it set inside the faucet for 2 hours before discarding. Adding water and letting it stagnate inside the faucet overnight for 16 hours. Collecting the overnight stagnation samples and analyzing for lead concentration (µg/L or ppb) of lead on Wednesday, Thursday, and Friday mornings (Monday and Tuesday collections are dumped and not analyzed). Inputs a) the results for the nine samples collected from Days 3, 4, 5, 10, 11, 12, 17, 18, 19 from each of the test faucets and b) the amount of water inside the faucets into an equation called “Lead Test Statistic Q.” This equation is designed to test whether a faucet, based on the average amount of lead from the 9 samples, would leach less than 5 µg of lead in 1 liter of water over the 16 hour stagnation period assuming the faucet is the only source of lead. Certifies the faucet if the Lead Test Statistic Q is below 5 µg (which is 5 ppb if dispersed in 1 liter of water or 20 ppb in 250 mL). Figure 1 from the Parks et al. 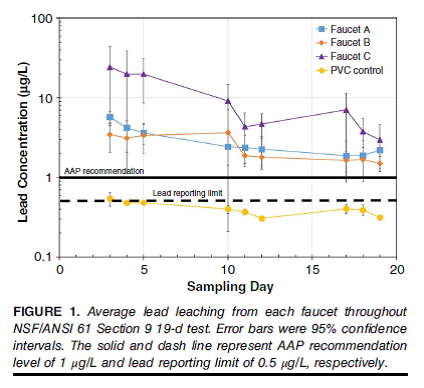 study shows the results on three brands of new faucets to illustrate the standard’s lead leaching protocol. As we said, the protocol is complex. To understand the implications of this protocol on lead levels from the faucet consider two possibilities. First, a typical faucet with 100 mL of wetted volume could average 48 ppb in the nine days of collected samples and still be certified. This is because the 100 mL sample at 48 ppb contains 4.8 µg of lead and is, therefore, less than 5 µg required by the standard. However a school or child care takes only a 250 mL sample. So a 4.8 µg release from the faucet into the 250 mL water sample would result in 19.2 ppb (4.8 µg/0.25L) – higher than one might expect from a brand new faucet that meets the NSF/ANSI 61 standard. Second, the protocol is likely missing the most highly contaminated water. The first sample collected is taken on Day 3 – after the faucet has been rinsed to remove debris and flushed ten times with the water allowed to stagnate 8 times for 2 hours and twice overnight. Because the amount of leaching is expected to drop with each flush, the levels on Day 1 (if they were measured) would be higher. After talking to NSF, EDF was invited to join a new task group convened by NSF’s Joint Committee to “investigate implementing a special higher-stringency certification level for products to be used in schools, day care centers, and for consumers desiring the additional level of protection for their families.” The Joint Committee is responsible for revising the NSF/ANSI 61 standard. Due to our conclusions that the current NSF standard is inadequate, we were glad to join the task group. Since April, the Task Group has periodically met with a goal of bringing back a proposal to the committee this month. At our first meeting, NSF’s Technical Manager shared an eye-opening report with the Task Group that reviewed the lead leaching protocol process and provided test results of 507 certified faucets. For this blog, EDF compared these results to two benchmarks: the 1 ppb limit recommended by AAP; and the Food and Drug Administration’s (FDA) maximum allowed daily intake of lead of 3 µg/day for children from all food and beverage excluding drinking water. The vast majority of products had a Lead Test Statistic Q of less than 1 µg (73% of 507 faucets, 86.3% of 117 flexible plumbing connectors, and 98.5% of small valves). In the Day 3 samples, 11% of 507 faucets leached more than 3 µg of lead. For a typical 100 mL faucet, the amounts of lead correspond to concentrations of about 30 ppb respectively. On Day 3, one faucet model averaged 39 µg of lead in 32 mL of sampled water – a stunning 1,220 ppb – yet still was certified because the Lead Test Statistic Q was less than 5 µg, and the amount of lead on all wetted surfaces of the faucet averaged less than 0.25%. Of the nine days of collected samples, Day 3 consistently had the highest lead levels in the water and levels were lower in later samples. The percent of faucets at 3 µg or more dropped from 11% on Day 3 to 2.5% on Day 10, 1.2% on Day 17, and 0.4% on Day 19. These results also mean that a school or child care that uses a new NSF-certified faucet to replace and older device could be in for a shock, if they sample shortly after putting the new faucet into service, given that the first draw samples can be over the 20 ppb action level that EPA used in the previous version of the 3Ts guidance. Buy only NSF/ANSI 61 certified fixtures (as is required in most states). If it is not certified under this standard, you have no assurance that it has even passed the problematic leaching test described above. Go beyond NSF/ANSI 61 standards, by demanding fixtures with no lead added to any wetted surface or ones with a Lead Test Statistic Q result of less than 1 µg. If you cannot find a faucet that goes beyond NSF/ANSI 61, then use a NSF/ANSI 53 certified filter for lead after installation or do not allow people to drink from a new brass fixture until it has undergone at least three weeks of flushing similar to that used in the protocol. As a routine practice, flush faucets – even if only for a few seconds – before collecting any water for cooking or drinking. These recommendations are not simple for a school or child care, and they are likely more difficult for a homeowner. A better, long-term solution is for NSF’s Joint Committee to revise NSF/ANSI 61 so it better protects children from lead in drinking water. An interim step would be to allow manufacturers to voluntarily have their fixtures certified to a 1 µg standard so they can be labelled for use in schools, child care facilities, and other places where children are likely to drink water. Most states require that plumbing components comply with NSF/ANSI 61. A wetted surface is the section of a device (e.g. faucet) that is in contact with water under normal conditions of use. NSF/ANSI 61 Section 3.5 allows lead to be added to brass and bronze as long as it complies with 0.25% limits in federal law. Critical evaluation of the NSF 61 Section 9 test water for Lead, Simoni Triantafyllidou, Marc Edwards, 2007 JAWWA https://awwa.onlinelibrary.wiley.com/doi/10.1002/j.1551-8833.2007.tb08035.x. This entry was posted in Drinking Water, lead and tagged 3Ts, AAP, child care, EPA, lead, Lead in Drinking Water, NSF, NSF/ANSI 61, Parks, schools. Bookmark the permalink. Both comments and trackbacks are currently closed.